I am always amazed by the impact the childhood readings have on my memories. Ever since I started the first journey in the magic realm of reading there were books that left a mark in me, but somehow those which are remembered more easily and cherished a bit more seem to be the books of childhood. Not that later there were no books that became important for me, but I always associate the stories of my childhood with a time of complete peace and contentment. These books are in a substantial number and someday I hope to relive them together with my son, among them, the magical “One Thousand and One Nights”. I believe I would relive them anyway, but until then Ticonderoga Publications gives me the opportunity to experience the themes from a new perspective and with added speculative fiction elements. Liz Grzyb’s anthology, forthcoming from Ticonderoga Publications, “Dreaming of Djinn” brings 18 new tales with the flavor of “One Thousand and One Nights”. I have to admit that besides Thoraiya Dyer, Jetse de Vries and Alan Baxter the writers appearing on the table of contents don’t ring any bell, but that was never chased me from a title that sounds interesting. More often than not it actually worked in favor of the book. Yesterday, the cover of the anthology was revealed as well and it is a high quality and artistic piece signed Nadiia Starovoitova. There is another interesting thing associated to my childhood readings and the cover of “Dreaming of Djinn”, Russian folk and fairy tales were also an important part of those books and usually the covers were adorned with amazing art pieces, similar to this one in style and quality. An artwork that instantly catches the eye and without effort captures the attention of the viewer. And not to mention, an important feature when a book is judged for its cover. Nadiia Starovoitova seems to achieve all that effortlessly with this wonderful art piece. 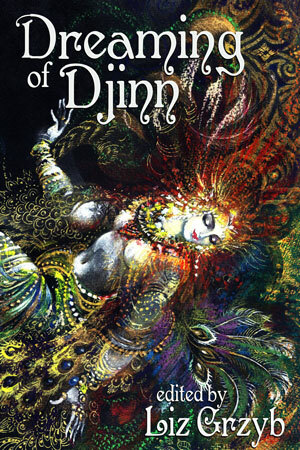 Liz Grzyb’s “Dreaming of Djinn” will be available in April. Scheherazade’s One Thousand and One Nights stories have captured imaginations for a millennia. Fairy tales and fables abound, telling of the fantastic and mysterious, the comic and dramatic. This anthology will explore romantic Orientalism through a speculative fiction lens. You might find lost cities, magical lamps, mummies, thieves, intrepid explorers, slaves, robotic horsemen, noble queens, sorcerers, outcast princes, harems, dancers, djinn, assassins and even smart-talking camels and cats, set in exotic Persia, Egypt, Arabia, the Ottoman Empire, or a modern incarnation of these. More information on the exact mysteries contained will be revealed shortly.